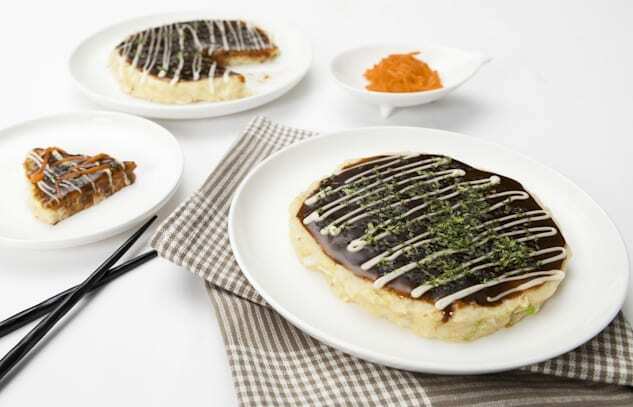 This is a Japanese savoury pancake. Okonomi means ‘as you like’, so you can put on whatever toppings you want. Pork and seafood are very popular toppings, or you could add corn, cheese or tofu—just use this recipe as a base. These pancakes normally use flour and egg but I have created this egg and gluten-free version—the texture is surprisingly similar. Add rice flour, potato flour, cabbage, salt and okara and mix well. Heat the oil in a frying pan on a medium heat and pour in half of the mixture. When the edge of the pancake looks dry, turn it over and cook until golden. Pour the okonomiyaki sauce on the pancake. Serve with mayonnaise, benisyouga and aonori. Tip: Add any toppings—try tofu, cheese, corn, carrot, shallot or your favourite vegetables. Vegan option: Replace the egg with ground flaxseed. Place 30g (1oz) ground flaxseed and 90ml (3fl oz) water in a food processor or blender and process until it is a thick and creamy consistency. Then stir in 200ml (7fl oz) water instead of 120ml (4fl oz) water. You can whip by hand instead of using a mini food processor but a food processor is much easier and gives a better outcome. Or you can use egg replacer. Simply follow the instructions on the packet. Using a whisk, mix all ingredients, except cabbage, for the pancake mixture, then add cabbage and mix.